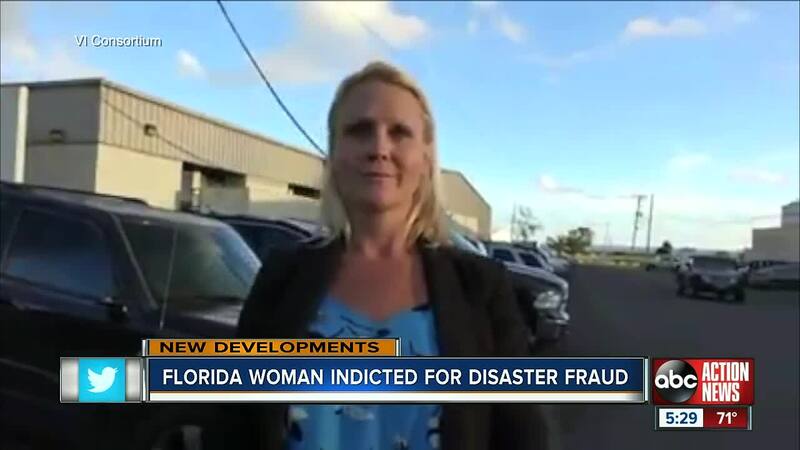 A Florida woman has been indicted for disaster fraud as court documents claim she faked more than $800,000 in false invoices through a FEMA program in the U.S. Virgins Islands. The indictment says Juli Campbell, owner of Campbell Development, LLC and two others have been charged with disaster fraud and identity theft. In a press release, authorities say the fraud charges are related to a FEMA program called STEP (sheltering and temporary essential power) that funds essential repairs to homes damaged by Hurricanes Irma and Maria. The indictments come after a grand jury heard the allegations of Campbell and her co-defendants executing a scheme where they would submit fraudulent invoices, even including on such invoices the names of workers who were not actually on the island. “The U.S. Attorney’s Office for the Virgin Islands is especially committed to making certain that federal funds intended for the victims of natural disasters are accounted for and used consistent with FEMA’s directives,” said U.S. Attorney Shappert. James Blankenberg, from the Tampa Bay area, said he worked for Campbell in St. Croix, "we deserve what's owed to us," he said. Blankenberg is just one of a dozen former subcontractors who claim they worked for Campbell and did not get paid in full. "All she did was take advantage of the government," said Blankenberg. The indictment states that through the STEP program is a series of agencies that eventually subcontracted Campbell development. The documents state the Virgin Islands Public Finance Authority was responsible for raising capital for essential public projects. Following VIPFA, they signed a contract with "A.C." who then hired a company identified as "P.R.G." who then hired Campbell Development in August of 2018. The documents allege Campbell made fake invoices in August, September, and October totaling more than $800,000. The documents also claim that, "in order to increase the amount of workers for whom Campbell Development could invoice for lodging and M&IE, Campbell continued to bring workers to St. Croix to work on STEP-funded programs, despite having no work for such persons and even after being told not to bring more workers by representatives of P.R.G." Blankenberg claims he's owed nearly $40,000 and his work truck that was shipped to the island is still stranded there. He said it's going to cost more than $2,000 to ship it back home, plus the taxes. "My lights got turned off, my water got turned off, my insurance elapsed," he said, "I’m finally digging myself out of the hole." Blankenberg said he has returned back to the Tampa area, and has now started his own small company called Blankenberg Flooring & More to try and get things right. His story is not alone, other subcontractors sent ABC Action News bounced checks, and claim they were never given plane tickets to return home to the states, leaving some stranded last fall. "We probably won’t see any money, hopefully we do, but I don’t think we’ll see any money," said Blankenberg. ABC Action News reached out to Campbell, who lives in the Panhandle about the indictment, but she said no comment. When asked about not paying workers, she told reporter Nicole Grigg, that's not accurate. Members of the public who suspect fraud involving disaster relief efforts, or believe they have been the victim of fraud from a person or organization soliciting relief funds on behalf of disaster victims, should contact the National Disaster Fraud Hotline toll free at (866) 720-5721.